1) Employees’ Health Insurance, 2) Employees’ Pension Insurance, and 4) Employment Insurance are mandatory by Japanese law. As a JET you pay one half of the combined premiums, and your Contracting Organization pays the other half. Your insurance does not cover personal belongings, even if there’s a natural disaster and you lose everything. This is a card you should carry at all times. Employees’ Health Insurance covers 70% of medical expenses for the insured JET, and the JET must pay the remaining 30%. Employees’ Health Insurance covers:medical examinations, medicines/medical care supplies, emergency treatments, surgeries, in-home medical care, hospitalization, and nursing care, etc. Employees’ Health Insurance does not cover: preventative vaccinations, unnecessary health check-ups, cosmetic surgery, unnecessary dental implants, orthodontic treatment, teeth whitening, exams and check-ups for normal (without complications) pregnancies, highly advanced medical treatments, etc. What this means is that usually JETs pay for 30% of their medical bills thanks to insurance, but for bills that exceed 267,000 yen, JETs will actually pay less than 30%! Note: The processing takes about 1 week before the form is sent back to you, so be sure to prepare this in advance! For further questions regarding Employees’ Health Insurance, please refer to the JET Program General Information Handbook, pages 50-57. The Pension Insurance System will provide for you or your family in the event that you are seriously injured or pass away. Every month, roughly 8% of your monthly salary (before taxes/deductions) will be deducted and placed into your pension fund. as the percentage is fixed. After leaving Japan you are entitled to apply for a Lump-Sum Withdrawal Payment, or a partial refund of the money you paid into the pension insurance. For a detailed explanation about how to acquire your pension refund (the Lump-Sum Withdrawal Payment), please click here, and you will be redirected to the After JET page of our website. Under this policy, comprehensive insurance coverage for overseas travel accidents is provided by a group of insurance companies headed by Tokio Marine & Nichido Fire Insurance Co., Ltd., under a contract with CLAIR. There is no mandatory need for JET participants to be enrolled individually, and insurance premiums are paid entirely by your BOE. Furthermore, no changes or additions can be made to the insurance coverage. (The contents of the policy are identical for all JET participants). This insurance covers treatment of illness and injury after you arrive in Japan for the portion of costs not covered by Employees’ Health Insurance, with the requirement that the medical treatment is covered by the Employees’ Health Insurance. Claims can also be made in the event that the JET participant passes away or sustains residual disability. Treatment will be covered in the case where a JET participant becomes ill or injured while temporarily returning to their home country or visiting a third country. 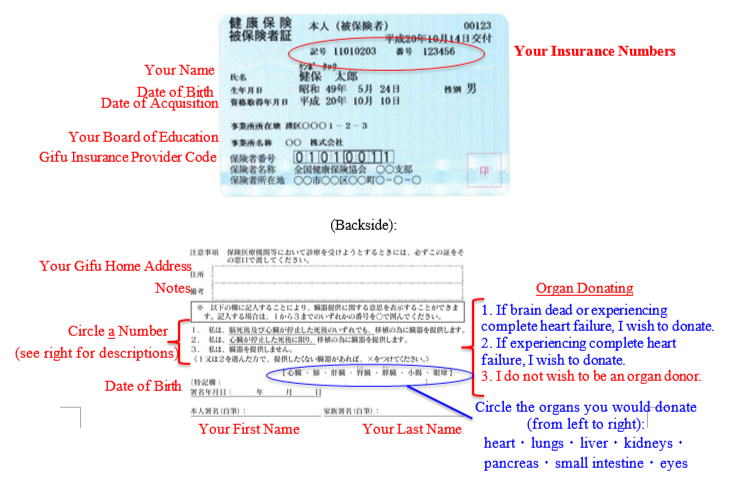 For new JETs, before you leave your home country, please download the JET Accident Insurance Insured’s Confirmation of Agreement Form from the JET Program website (again, prior to your departure), sign it, and submit the form to the Embassy or Consulate General of Japan according to their deadline (if you wish to enroll). For specific information regarding necessary documents and procedures for making claims, you should contact the appropriate Insurance Service Center within 30 days of the accident or the start of the illness and follow their instructions. In order to file claims, please keep all related receipts. It is possible for persons who fulfill the necessary requirements to receive unemployment benefits if their period of stay is still valid. Enrollment begins at the same time as your employment period. JETs pay 4/1,000 of their gross annual remuneration during their time on JET. The BOE is responsible for paying an amount equal to 7/1,000 of your gross annual income. In general, the premium payment will be deducted at source from the JET participant’s monthly remuneration. The following JET participants are not required to enroll in Employment Insurance. JET participants who believe that they may be exempt should consult with their BOE immediately. 2) Participants who can prove that they are eligible to receive unemployment insurance benefits in a foreign country. 3) Persons who work in a Japanese office after entering into an employment contract established in a foreign country.